What if we don’t want to put an enormous amount of time and effort into a company blog? A client asked me recently: What if we just want to have a blog that’s just good enough to help us with search engine rankings, but won’t win any awards? No! The world doesn’t need one more plain vanilla corporate blog. The client’s question was based on several misunderstandings and myths about corporate blogging. What good is a corporate blog and why put the time, money and effort into building and sustaining one? Let’s say that people now come to your website to buy your products somewhere between two and four times a year. A blog that is interesting, interactive, well-designed and professionally written can create daily readers who will have your company top of mind every day. Email is becoming more of a nuisance every day for most people, and it’s become harder, and more expensive, to create effective email campaigns. Your customers and potential customers undoubtedly don’t pay a lot of attention to your online display ads – no matter how annoying you try to make them. When people do get to your blog, you need to be talking about what people want to hear, not just what you want to tell them. Simple as that sounds, heavy-handed selling or, worse yet, bland “don’t offend anyone” writing are the major reasons that nobody reads most corporate blogs. The vast majority of corporate blogs lack a compelling graphic identity. They’re bland looking and they have bland content. They have tiny pictures or they rely on cheesy clip art. There’s no excuse for that when there are sites like iStockphoto with images for as little as $1. Posts that are more than 300 words are unlikely to be read – unless they consist of short sentences and paragraphs; bulleted points; subheads and plenty of white space. Who has time to read 1000-word+ posts on your blog? if you need more than 300 words in a blog post you probably should split it into a series of posts. The easy answer is to have a professional writer or editor on your corporate blog. Is all this going to be cheap? No! A good corporate blog costs money and time. Time to write, promote and most of all, time to build an audience over time. o Give them the opportunity to create content. People love to send stories and photos and videos to blogs they like. Incentiveize them. Blog readers are there by choice. You can’t force anyone to read a blog. What you can do is make the blog totally freaking amazing. 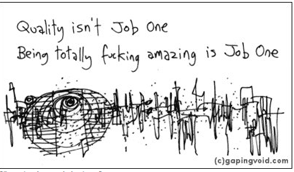 Note: I have the cartoon above, by Hugh Macleod, on my business cards. If that offends you, you probably won’t like working with me. If it turns you on, and you are thinking about having a corporate blog. Gimme a call. I do also have a polite business card, a cute one, and a funny one. I use them as needed. Posted by B.L. Ochman, all rights reserved. This entry first ran in 2007. It holds up pretty well!